Dibrugarh University Assistant Professor in Physics Department Recruitment 2018 July :- Hello Assam Career Job News Regular readers. Earlier we have notified you about Dibrugarh university Recruitment of Assitant Professor in Various subjects and now in this post we are about to mention you another new Recruitment at Dibrugarh University. 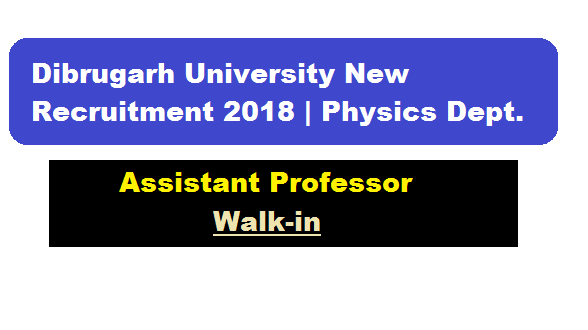 Dibrugarh University has again issued a new notification for filling up Assistant Professor posts in Physics department. A walk in interview will be held on 30-07-2018 and 31-07-2018 at 10:00 AM and 2:00 PM in the Bhojraj Seth Conference Hall of the Vice-Chancellor’s office, Dibrugarh University for filling up 4 [four] temporary positions of Assistnat Professor in contractual basis in the Department of Physics , D.U . In this section, we will discuss in detail about Recruitment of Assistant Professor in Physics Dept. Under Dibrugarh University Recruitment 2018 with all the details and requirements. Candidates must passed M.Sc. with First Class with respective specialization.